The Golden Temple is a Sikh Gurudwara located in Amritsar, India. Construction of the gurdwara was begun by Guru Ram Dasji, the 4th Sikh Guru and completed by his successor, Guru Arjan Dev ji. In Isvi 1604 Guru Arjan Dev ji completed the Adi Granth, the holy scripture of Sikhism, and installed it in the Gurdwara. In this temple, the upper floors and the tomb is covered with gold, that is why the name golden temple, also called Swarna Mandir, is famous for its distinctive appearance. 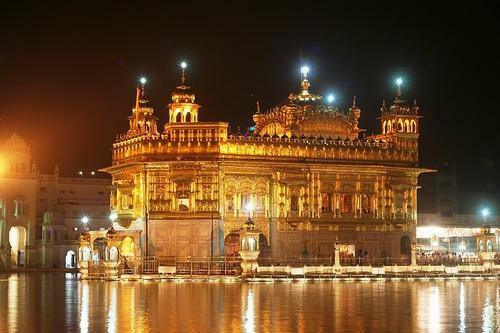 It is the most sacred pilgrimage place of Sikhs in India. It is also known as Shri Darbar Sahib. The architecture of this Temple represents a unique harmony between the Hindus and the Muslims. It is no doubt one of the most beautifully constructed specimens of the world.